We Pore Girls are big fans of Crunchy Betty, and one of the best things I’ve gotten out of her blog is washing my face with honey. Really? You might ask. Honey? YES. Honey is an amazing and gentle face wash for any skin type. It is healing, slightly drying to get rid of excess oil, but also moisturizing since it's a humectant (meaning it draws moisture from the air into your skin). It is also naturally antibacterial and great for combating blemishes. And it rinses away completely with a little lukewarm water. Basically, it’s kind of magical. I like to use it in the morning to wash my face, since it doesn’t wash away makeup. But if your face is bare, you can use it whenever you like—remember it’s generally best not to wash your face more than twice a day. If you decide to give honey on your face a go, try to find raw and organic honey, preferably from a local source. You can use more conventional honey of course, but processing tends to get rid of some of its beneficial and antibacterial properties. And if you use an unstrained kind with little fragments in it, it will also add some exfoliating action to your skin. The honey in the photo is in a glass jar but I just pour some out into a squeeze tube for easier access. I have oily combination skin and honey leaves my face feeling clean but not tight, soft, and glowy. It’s ideal for any skin type, and is especially great for sensitive and acne-prone skin since it is so gentle. Just rub a quarter-size drop into your face (dry or slightly damp) and rinse away. It can also be left on for 5-10 minutes as a mask. 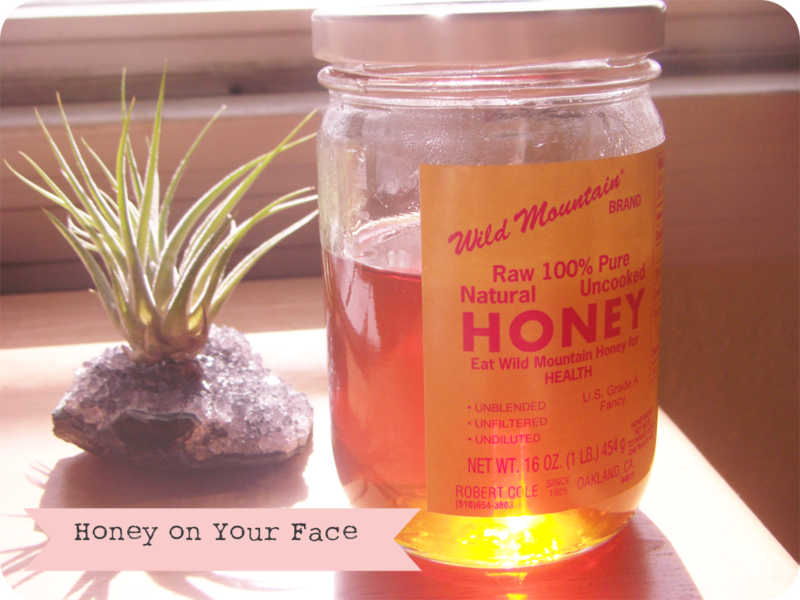 And chances are you already have some in your pantry, so do yourself a favor and put some honey on your face! I've never thought about trying honey! Thanks for the suggestion. Just wondering: Is there a specific brand you like? The natural kind shown above, or will any kind do? Yeah, it's great! No specific brand, just try to find something as unrefined as possible. If your grocery store is like mine and doesn't have much of a selection, you can try Amazon or Vitacost. But any kind will still be good for your skin. Thanks for reading!